The cultural blockade is part of an all-out unjust siege imposed on Iraq. The cultural contact with the world has been accordingly impossible. 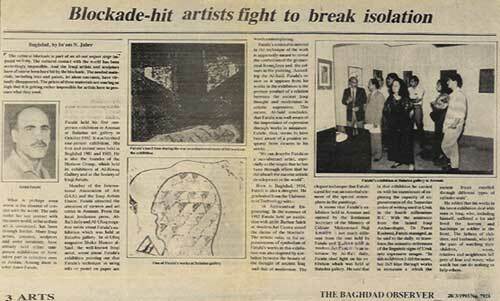 And the Iraqi artists "Painters and sculptors" have of course been hard hit by the blockade. The needed materials, including inks and paints, let alone canvases, have virtually disappeared. What is perhaps even worse is the absence of contact with the world. The only outlet for any contact with outer world, as far as their art is concerned, has been through Jordan. Many Iraqi artists, painters, sculptors, and some ceramists, have already held either one-person exhibitions or have taken part in collective ones in Jordan. Among them is artist Amer Fatuhi. Earlier, Fatuhi held his first one-person exhibition (The Chamber) in Amman at Baladna art gallery in October 1992. It was his third one-person exhibition. His first and second were held in Baghdad 1981 and 1985. He is also the founder of the Horizon Group, which held its exhibitions at Al-Riwaq Gallery and at the art gallery of Iraqi Plastic "Visual" Artists Society. Member of the International Association of Art (iaa) in Paris and the Iraqi Artists Union, Fatuhi attracted the attention of viewers and art critics in Amman. From the local Jordanian press, Al-Ra’i daily and Al-Ufuq magazine wrote about Fatuhi’s exhibition which was held at Baladna art gallery. In Al-Ufuq magazine Shakir Hassan Al-Said, the well-known Iraqi artist, wrote bout Fatuhi’s exhibition pointing out that Fatuhi’s technique in using mixed media on paper are worth contemplating. Fatuhi’s noticeable interest in the technique of the work is apparently meant to reveal the symbolism of the geometrical forms, lines and the colors in the painting. According to Al-Said, Fatuhi’s vision as it appears from his works in the exhibition is the profuse product of a relation between the ancient Iraqi thought and modernism in artistic expression. This means, Al-Said concludes, that Fatuhi was well aware of the importance of expression through works in miniature. Fatuhi, thus, seems to have been aware of a positive response from viewers to his works. "We can describe Fatuhi as a neo-abstract / Post-Modernism artist, especially as the stages that he has been through affirm that he did absorb the current artistic development in the world". 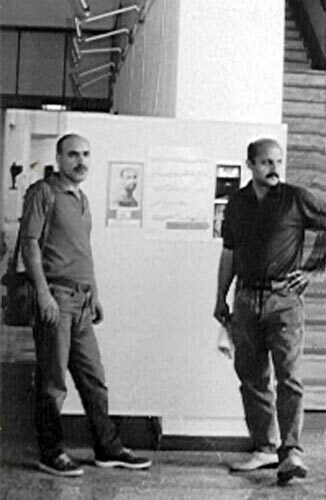 In the summer of 1992 Fatuhi held an exhibition with artist Burhan Saleh at the Modern Art Center around the time of the blockade. The artistic value or the expressiveness of symbolism of Fatuhi=s works in this exhibition was also inspired by a relation between the beauty of ancient Iraq and that of modernism. The elegant technique that Fatuhi cared for was an essential atmosphere in the paintings. It seems that Fatuhi’s exhibition held in Amman and opened by the Jordanian Secretary of the Ministry of Culture Mohammed Naji Amaira is not much different from the one held by Fatuhi and Burhan Saleh at the Iraqi Modern Art Center then interviewed by Al-Ra’i daily, Fatuhi shed light on his exhibition which was held at Baladna gallery. He said that in the exhibition "The Chamber" he carried on with his experiment of exploring the capacity of expressiveness of the Sumerian codes of writing used in Uruk in the fourth millennium B.C. With the assistance from the famed Iraqi Archaeologist, Dr. Fawzi Rasheed, Fatuhi managed, as he said to the daily, to transform the semantic references of the linguistic signs of Uruk into expressive images. "In this exhibition I did the same, but this time through works in a miniature art which the ancient Iraqis excelled through different types of cylinder seals". He added that his work in his latest exhibition deals with man in Iraq, who, including himself, suffered a lot and lived the horrors and hardships as a soldier at the front, the fathers of children, and husbands, who felt the pain of watching their children, wives, relatives and neighbors fall prey of fear and worry, who watch but can do nothing to help others.